Like still waters, de la Peña (A Nation’s Hope) and Robinson’s (Gaston) story runs deep. 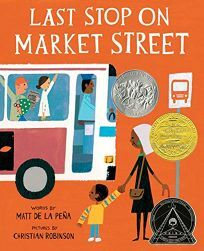 It finds beauty in unexpected places, explores the difference between what’s fleeting and what lasts, acknowledges inequality, and testifies to the love shared by an African-American boy and his grandmother. On Sunday, CJ and Nana don’t go home after church like everybody else. Instead, they wait for the Market Street bus. “How come we don’t got a car?” CJ complains. Like many children his age, CJ is caught up in noticing what other people have and don’t have; de la Peña handles these conversations with grace. “Boy, what do we need a car for?” she responds. “We got a bus that breathes fire, and old Mr. Dennis, who always has a trick for you.” (The driver obliges by pulling a coin out of CJ’s ear.) When CJ wishes for a fancy mobile music device like the one that two boys at the back of the bus share, Nana points out a passenger with a guitar. “You got the real live thing sitting across from you.” The man begins to play, and CJ closes his eyes. “He was lost in the sound and the sound gave him the feeling of magic.” When the song’s over, the whole bus applauds, “even the boys in the back.” Nana, readers begin to sense, brings people together wherever she goes.